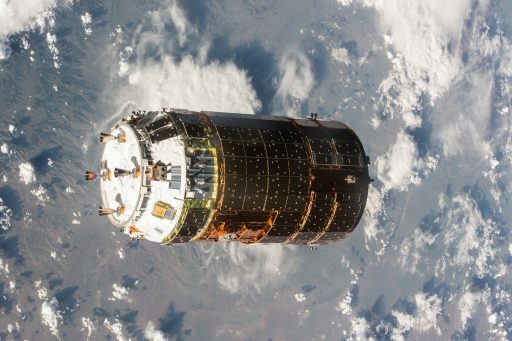 The HTV-5 spacecraft is ready to wrap up a four-week stay at the International Space Station that was dedicated to the delivery of crucial cargo, re-stocking the shelves aboard the orbiting complex that had gotten rather empty given the loss of several cargo missions in the past year. HTV-5 delivered to ISS plenty of consumables, new scientific payloads, large internal racks as well as the CALET Calorimetric Electron Telescope. With internal and external cargo operations completed successfully, Mission Control approved HTV-5 for its departure on Monday that will be followed by a targeted destructive re-entry on Tuesday. HTV-5 blasted off from Japan atop an H-IIB rocket on August 19, arriving in a Low Earth Orbit for a five-day link up with the International Space Station that culminated in the craft’s automatic rendezvous with ISS to allow it to be captured by the Station’s robotic arm that was being controlled by Japanese Astronaut Kimiya Yui. 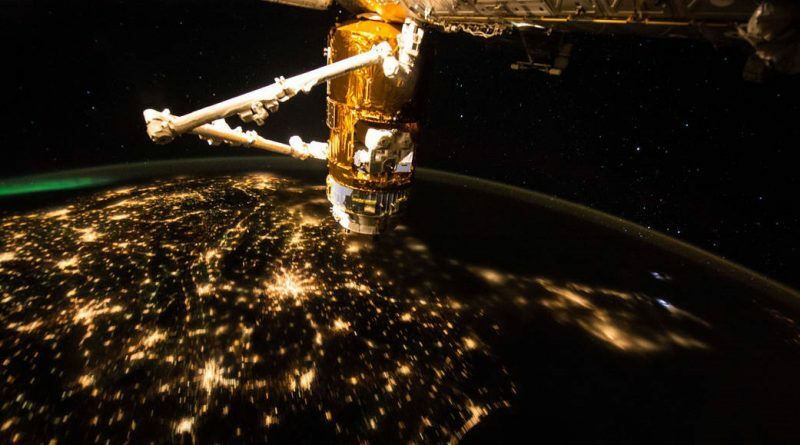 Once attached to the Harmony module of ISS, HTV-5 was opened for business to mark the start of the transfer of over six metric tons of cargo. Packed into the Pressurized Logistics Carrier of the HTV spacecraft were 242 Cargo Transfer Bags filled with food provisions for the crew, 600 liters of water, spare parts for the various ISS systems and a range of other hardware. 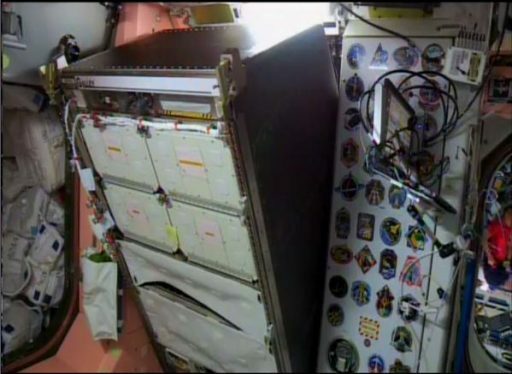 Also aboard the HTV were large science facilities and two new Racks – a new Galley Rack that found its new home in the Node 1 Unity module and a new Multi-Purpose Small Payload Rack, now installed in the Kibo module to facilitate a number of scientific experiment payloads. The new Galley Rack provides the crew with an additional water dispenser and food warmer to prepare their meals. While cargo transfers were in full swing inside the spacecraft, external cargo operations got underway with help from the Station’s robotic arms, the larger Canadarm2 and the Japanese Remote Manipulator System that shook hands when Canadarm2 handed the Exposed Pallet, extracted from HTV, off to the Japanese Arm that was then used to temporarily stow the EP on the Exposed Facility of the Kibo module. Next was the relocation of CALET to its location on the Exposed Facility from where the telescope will monitor energetic particles incoming from deep space for the continued study of dark matter signatures. External cargo operations continued from August 29 through September 1 as the Station’s robotics controllers had plenty of work, tasked with moving three no-longer-needed payloads to the Exposed Pallet for disposal. These payloads are the SMILES Superconducting Submillimeter-Wave Limb-Emission Sounder, the Multi-Mission Consolidated Equipment, MCE, and the Space Test Program Houston 4 payload. SMILES has operated since 2009, featuring a number of sensors to detect radiation emitted by minor constituents within Earth’s atmosphere to make a number of measurements including global ozone distribution and its temporal variation. The Multi-Mission Consolidated Equipment hosted a number of payloads ranging from scientific sensors to technical demonstrators. Similar in nature, the STP-Houston 4 payload also provided a platform to a number of technical demonstration payloads for the development of future space hardware. 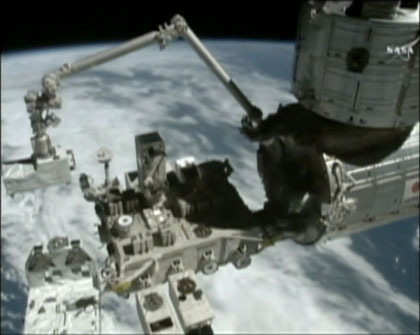 When the external payloads were installed on the Exposed Pallet, it was retrieved by the Japanese robotic arm and the robotic handshake was repeated to hand the EP off to Canadarm2 that then maneuvered it back to the HTV-5 spacecraft. The Exposed Pallet was inserted back into the Unpressurized Logistics Carrier on September 16 to give the three disposal payloads one last fiery ride, freeing up spots on ISS for future payloads. With external cargo operations completed, all internal items moved to the ISS side and plenty of trash and no-longer-needed items placed inside the Pressurized Logistics Carrier, HTV’s mission at ISS was done and the craft was declared ready for departure. Polling within the ISS Mission Management Team was performed on Thursday with an unanimous GO given for the craft’s Monday unberthing and release. The crew will work on Sunday to close out the spacecraft, making sure all disposal cargo bags are secure and also removing lighting fixtures and fire extinguishers for use on ISS since leaving them on HTV would be of no use. When air ducts are removed, the crew will close the HTV hatch and begin the process of outfitting the vestibule between Harmony and HTV. They will install the Central Disk Cover and four Controller Panel Assemblies that will be used to drive open the 16 CBM bolts currently holding the craft in place. Data and power jumpers will also be removed, though one power connection will be left in place overnight to Monday. Getting up early, the crew will remove that last jumper and close the Harmony hatch to allow leak checks to begin in order to verify that the hatch seal is air tight. 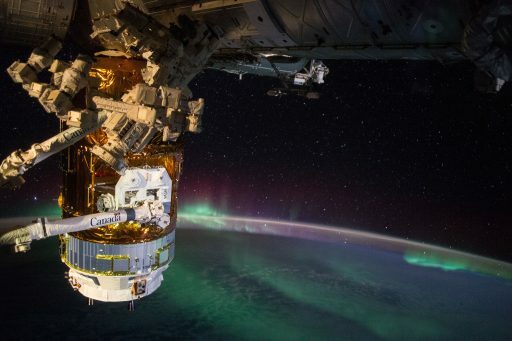 Once leak checks are complete and good, the crew and teams on the ground will work together, driving open the 16 bolts in four sets of four and opening four capture latches to free the HTV spacecraft that will then be in control of Canadarm2. A procedure taking about one hour will put the arm and HTV through a series of maneuvers to position the spacecraft in its departure position. When HTV-5 is in its release position, ROBO controllers will hand off to Kimiya Yui and Kjell Lindgren who will reconfigure the Cupola Robotics Workstation for the release of the spacecraft. When given the GO from Mission Control, the crew members will set up for the release – Yui as the arm operator and Lindgren in charge of commanding the spacecraft, monitoring the departure and communicating with the ground. Release is set for 15:20 UTC on Monday. 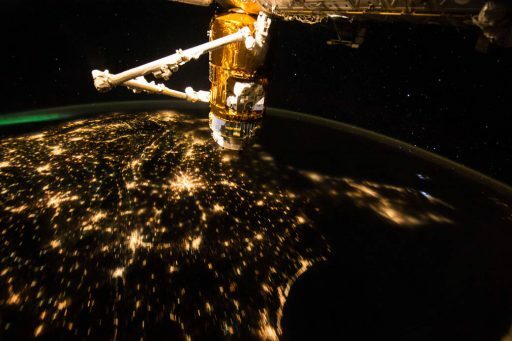 As snares on the robotic arm are opened, orbital mechanics will pull the HTV spacecraft down and away from ISS, thus freeing up the Latching End Effector of the Robotic Arm. When the LEE is free, Yui will retract the arm to a safe distance for the first departure burn. HTV-5 will recover from Free Drift and gently pulse its thrusters five minutes after release for the first of two separation burns. Departing the Space Station along the R-Bar, HTV-5 will drift away to a safe distance for the second departure burn that significantly increases its opening rate to move the spacecraft out of the Keep Out Sphere and Approach Ellipsoid at which point NASA involvement in the mission ends with JAXA in full control of the last several hours of the mission. A pair of descending maneuvers are planned when the vehicle is 300 and 5,000 meters from ISS to place it in its independent orbit. More maneuvers will follow to gradually decrease the orbital altitude of the spacecraft leading up to the final deorbit burn that will put the spacecraft on its re-entry trajectory, aiming for Entry Interface over the Pacific Ocean. Re-Entry is expected at 20:31 UTC on Tuesday to mark the end of the fifth H-II Transfer Vehicle Mission.